Architect Michael Cobb used Douglas fir harvested from the site throughout the house, such as on a sliding door outfitted with Swiss Rod SS hardware from the Real Carriage Door Company. 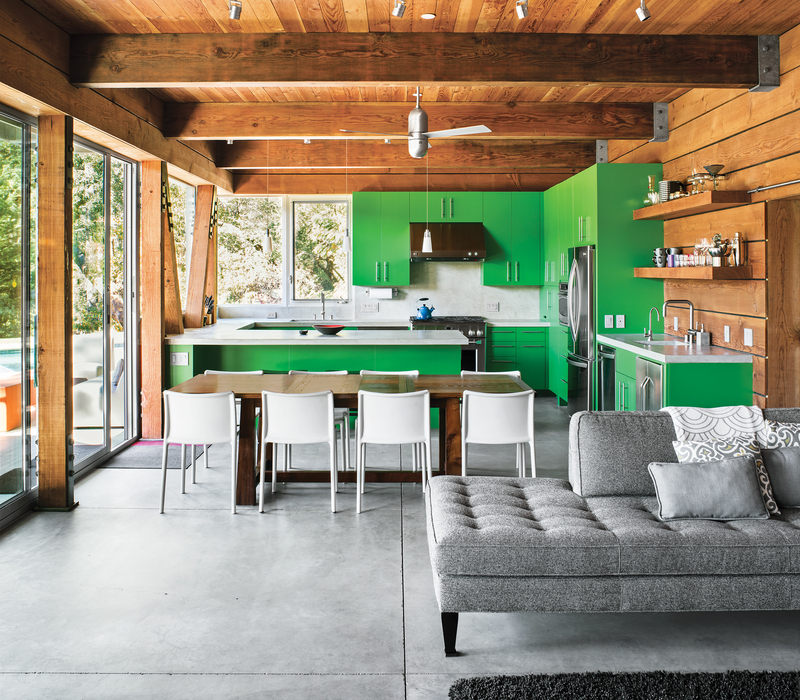 In the kitchen, Santa Rosa–based Reliance Fine Finishing applied a conversion varnish tinted with a green hue. “Things that have the virtue of being simple have become some of the most complicated forms of construction,” Cobb says. Image courtesy of Drew Kelly . Architect Michael Cobb prefers using natural building materials—like straw bales and rammed earth—in his structures; however, he often finds them to be cost prohibitive due to the extra fortifications needed to meet California’s seismic requirements. “Things that have the virtue of being simple have become some of the most complicated forms of construction,” he says. Then Cobb discovered Agriboard, a structural insulated panel made from oriented strand board and a compressed agricultural fiber core, which he used to construct a weekend house for a young family in Healdsburg, California. “It represents an affordable way to build with relatively unprocessed materials,” he says.